Hello party girls and happy monday! I am writing this post as I look outside my window into the gloominess and darkness that is coming toward me. Being born in Argentina, I absolutely LOVE the sun and the warm weather. That’s why cold, stormy days like today really put a damper on my mood. That’s why I am glad I am writing this post today, because nothing cheers me up like a cute nail design! The design I chose to do for this week is fairly simple, and many of you have probably seen it somewhere around pinterest or instagram already. But that’s ok, because this design is so classic and pretty that it will never get old. I am talking about the party nail design!! 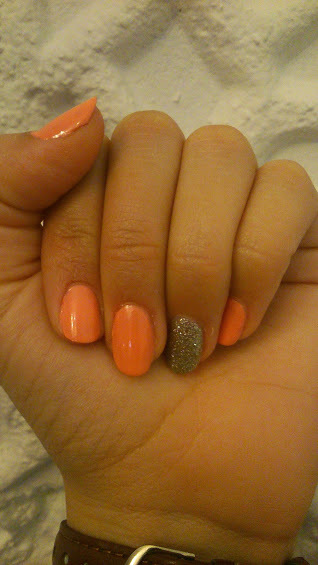 In this case I have chosen to do a summer version of the nail design, and added a bit of sparkle to make it more fun. I decided to use Beyond Cozy by ESSIE for the silvery gold accent. It’s not like other sparkles that barely the nail, and the golden and silver hues can be paired with anything. I also chose a very summer coral/orange colour of which I cannot remember the name. But the exact colours don’t matter, personalize it for what works for you! I have chosen to make my ring finger the party nail, and the rest the coral/orange colour. I loved the way they turned out, and I think it is a simple way to add some glam and sparkle to a normal manicure. What do you think of this summer manicure? Leave us a comment below or send us a picture of how yours turned out!